The two-stone edge squeeze tesuji , also known as the "stone tower", is commonly used in capturing races and can occur not just in the corner, but also anywhere on the edge. Also known as stone monument tesuji, stone tower tesuji, stone pagoda squeeze, or tombstone squeeze. See also two-stone corner squeeze. White to save his group. and form the first part of the two-stone edge squeeze tesuji. Note that is forced, as atari from the other direction leads to the capture of one of the two groups cut apart. (see later) also prevents the atari at a. 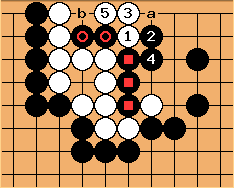 The throw-in at , which is the second part of this tesuji, forces the capture at . is an atari on three Black stones; White lives if these three stones are captured (see capture three to make an eye). If connects, then after , it's one eye to none. White wins the capturing race. 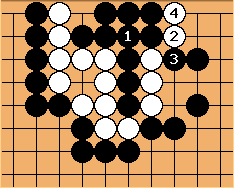 Blacks best defence after is to save his stones with , forcing . 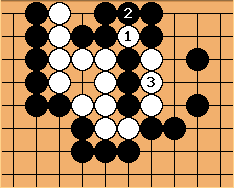 Later Black can play at a as a big ko threat: White needs to answer at b or his group dies. Willemien Is it not better to also keep the - exchange as ko threat? W at 4 would remove the ko threat and capture the stones. That would be bigger than . Giving atari at the wrong side makes it all too easy for White. Not only Black can do nothing to prevent White capturing the stones, but also White can in the endgame capture the stones (by playing at a). But probably a tenuki elsewhere is bigger than this. This particular position is also known as the two-stone corner squeeze. In this capturing race, is necessary to reduce White's liberties. The first part of the two-stone edge squeeze tesuji is the descent at . The next part of this tesuji is the throw-in at . In this position is yet another good move, if prevents the atari, wins the capturing race. Depending on the condition on the left side, one might argue that is a better move. But it does not change the fact that and capture the key stones. is too slack. Up to , White wins the capturing race by one move. pwaldron? : John Power remarked to me recently that the actual translation for this should be tombstone squeeze rather than a stone tower or (from the [Slate & Shell] translators) stone pagoda squeeze. This discovery was apparently made after a fair bit of digging around in some dictionaries. I have no Japanese knowledge of my own and take this on faith, but looking at the position the two stones being squeezed do rather resemble a tombstone. Bill: I like tombstone squeeze. :-) But it is not a literal translation. Tombstone in Japanese is 墓石 . However, it appears that the pagoda derives from the word stupa, which began as a burial mound for the Buddha's remains. And a tombstone can be a stone pagoda. 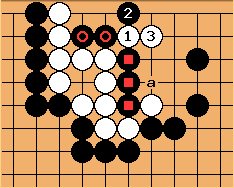 John F. I wrote about this tesuji in the new Go Companion as being the case of having perhaps terms than any other (some not mentioned here). Although I didn't say so there, the reason sekito is hard to find in ordianry Japanese dictionaries is that it was a term invented by Maeda Nobuaki (1950s, I thnk), and he intended it to mean the shape of a Japanese gravestone. Although I used tombstone in GC, it was with reservations. I tend to associate a tomb with a large underground burial space, whereas a Japanese gravestone really marks a place for burial of a tiny urn (if that), but on looking it up I found that tomb can apparently be used for a burial spot in general, so I stick with that. In any event, I think any references to pagodas and stupas are de trop. BuggyMind: (consults a dictionary) I think the phrase 'de trop' is de trop.